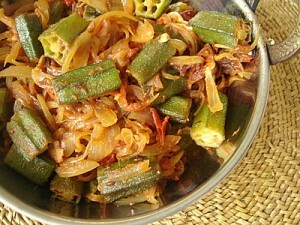 Bhindi Pyaz recipe by Mariam at DesiRecipes.com. 1/2 kg Okra / bhindi slice into 1/2" pieces. Discard top and end. In a large heavy base pan, heat the oil over high heat. Add okra and mustard powder and fry for about 5 minutes. Remove from pan and put aside. Fry onion in the same oil for about 5 minutes. Add okra (bhindi ), chopped tomatoes, green chilli and rest of the ingredients. Cover and cook over low heat for about 15 minutes. Serve with Chapati. I don't like these recipes they made me feel disgusted! What is mustard powder?I know it is NOT haldi [turmeric]. Do you mean mustard seeds? i'll try it for sure n write my comment!